Air popped popcorn is a crunchy, low-calorie snack. It's a whole-grain food that supplies you with a small amount of dietary fiber, vitamins and minerals. 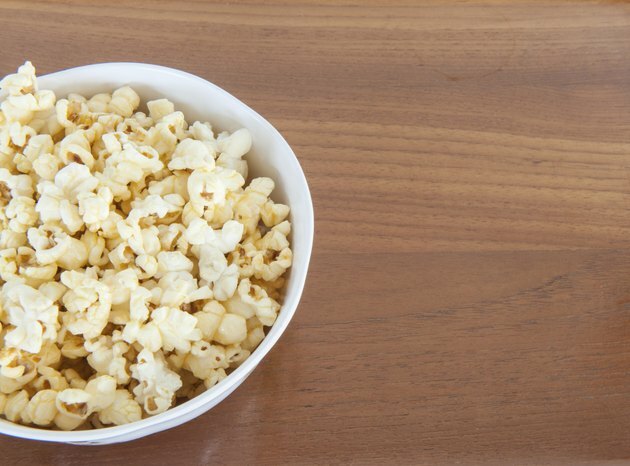 Choose popcorn in place of chips, pretzels or crackers to limit your calorie and fat intake. It's important to note that popcorn does get stale quickly, so pop it in small batches. One ounce of popping corn makes about 3.5 cups popped. Eating 1 cup of plain, air-popped popcorn provides only 31 calories, no fat and 1 gram of protein. Popcorn makes a great low-calorie snack to keep you on track when working to lose or maintain your weight. Avoid adding butter, as it can pack on the calories fast. If you need a little more flavor, try adding garlic powder, black pepper, Italian seasonings, curry powder or even a few sprays from an olive oil mister. Most of the 31 calories in popcorn come from carbohydrates. From 1 cup of popcorn, you'll get 6 grams of carbohydrate, 1 gram of which comes from dietary fiber. This makes popcorn a relatively low-carbohydrate food. It's also a whole-grain food, which means it hasn't been processed or refined. Eating a diet rich in whole grains helps you meet your daily need for fiber. Among other things, fiber helps regulate digestion, may help lower cholesterol and may aid in weight management. Air-popped popcorn contains trace amounts of the B vitamins, thiamin, niacin, B6 and folate. While none of these vitamins are present in significant amounts, eating popcorn along with a healthy diet helps you meet your daily need for these vitamins. Your body relies on B vitamins to help metabolize energy, maintain healthy red blood cells and to support proper brain, nervous system, muscle, immune system, heart, skin and digestive health. Popcorn also contains small amounts of certain essential minerals including magnesium, phosphorus, zinc, manganese, iron, potassium and copper. As with vitamins, eating popcorn in addition to a healthy and balanced diet helps you meet your need for these minerals.